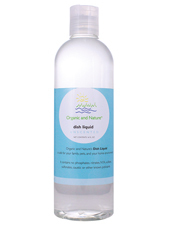 Product Description: Organic and Nature's Dish Liquid is great at removing grease and food from dishes, produces generous suds, and leaves a film-free shine that you can see. Natural and non-toxic, this dish liquid is gentle on your hands and helps keep skin soft. Using a natural non-toxic dish liquid eliminates the danger of keeping toxic products near food areas where they might be ingested. Organic and Nature's Dish Liquid is ideal for sensitive skin, and people sensitive to scents and perfumes, or with asthma or allergies. This product was formulated from the safest ingredients available and contains no solvents, sulfates, glycols or phthalates. Ingredients: Plant-Based Food-Grade Ingredients including Glucoside (Sugar) from US Corn, Cocoyl Amide (Coconut), and Palm Fatty Acids; Organic Aloe Vera Gel and Spring Water. Does Not Contain: Phosphates, Nitrates, NTA, Sulfates, Sulfonates, Caustic or other known pollutants. Suggested Use: Use a small amount of dish liquid on a sponge to cut grease and to keep dishes clean and bright.